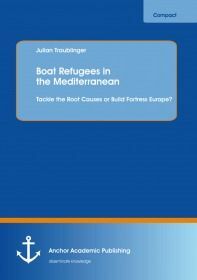 In this study about the boat people in the Mediterranean the emphasis lies on Italy and on the EU policy on refugees in the Mediterranean in cooperation with African states. Regarding the EU policy it deals particularly with the border security agency Frontex that has access to a rapidly growing budget coming from the EU funds. The advocates of the EU politics like to stress that their policies are in the best interest of the migrants themselves, their native countries and their destination countries, which means that a 'triple win situation' can be produced. However, refugee aid and other human rights organizations criticize harshly that refugees are criminalized and that their legitimate right are not guaranteed. The author depicts state networks on illegal migration and follows the question whether the EU has the wish to grant the refugees their rights.